Instant downloads of all 946 LitChart PDFs (including The Lone Ranger and Tonto Fistfight in Heaven). LitCharts assigns a color and icon to each theme in The Lone Ranger and Tonto Fistfight in Heaven, which you can use to track the themes throughout the work. James Many Horses argues with his wife, Norma. He attempts to leave and drive off in a mixture of “victory and defeat,” but forgets his car keys. He re-enters their home and jokes that he is home from the wars. His wife ignores him and pulls on a pair of cowboy boots. She tells him she is going dancing, and she takes the car out. James eats a lonely dinner, then gets dressed and hitchhikes down the tribal highway to the Powwow Tavern. A man named Simon gives him a ride, and asks why he’s fighting with his wife. James replies that he “told her [he has] cancer everywhere inside.” When he started joking about dying, his wife became enraged. James tells Simon that his “favorite” tumor is the size of a baseball, and that, upon seeing it, he asked his wife to call him Babe Ruth. In this story, we see James Many Horses—the prophetic child orphaned in a fire—as an adult. However, he seems very different from the vaguely supernatural prodigy he supposedly was in his youth. He is now a man who mostly prides himself on his quick wit, and continually gets in trouble with his wife for his constant joking, even in the midst of dire situations. His advanced-stage cancer diagnosis is something he’s chosen to make light of, rather than succumbing to pain, anger, isolation, or feelings of unstoppable loss; however, his wife, the stubborn and sensitive Norma, is not at all on the same page. At the Tavern, James finds Norma. The two reconcile, and Norma tells him that if he “say[s] anything funny ever again,” she will leave him. James takes her hand and tells a joke. Norma stands up and leaves him. James tests the boundaries of his relationship with Norma and finds himself alone. Norma, fierce and in pain, torn between love and hatred, leaves James on the spot. James and Norma connected deeply and instantly. Their first date in front of the television symbolizes their relationship’s power to provide them each with imagination and escape. When the television fades to white noise, its interruption has no effect on them, symbolizing their ability to love each other in a grounded, present way. Their relationship has always been framed by humor, and by laughing in the face of darkness or loss. James is perhaps recalling this anecdote out of an inability to understand why Norma has left him in the face of his joking. 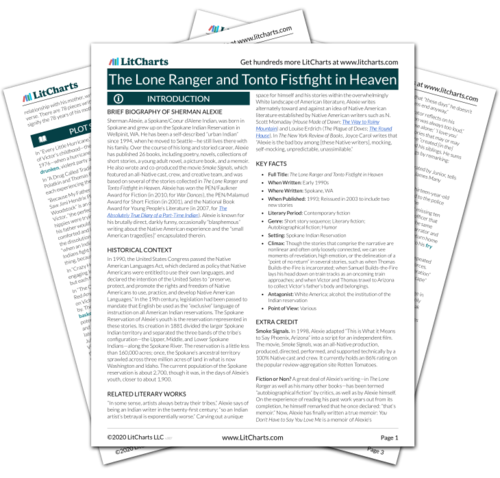 Get the entire Lone Ranger and Tonto Fistfight in Heaven LitChart as a printable PDF. Three months after Norma leaves him, James receives radiation treatments in a hospital in Spokane. The treatments are useless, and James’s doctor tells him that he’s still dying. James is in pain, and is alone and isolated; no one but his doctor is there for him. James remembers a specific day—January 22nd—when Norma, “the world champion fry bread maker,” made her best fry bread ever. Shortly after their meal, the phone rang with news that Norma’s mother had passed away. After receiving the news, James told the person on the other end “Thank you;” through tears, he and Norma laughed about the ridiculousness of the situation. Though Norma told James to stop laughing, he didn’t—“then or now.” Laughter, James says, “saved Norma and [him] from pain.” Once, on their way to a movie and dinner in Spokane, James and Norma were pulled over by a bad cop, who threatened them and stole their money. Norma, James said, joined him in helping to bring humor into the horrible situation. Again, we see two instances in which James’s humor—and Norma’s willingness to play along and participate in it—brought levity and light into painful, violent, isolating situations within their marriage and life in general. James’s humor acts in a similar (but healthier) way that alcohol does for many of the other characters—it’s a method of dealing with the often brutal and depressing realities of life. Norma’s betrayal hurts James, but her return to him in the face of his death is welcome. Norma provides James with safety, security, and love; she arrives, in the end, to bear witness to his death, to ease his pain, and to provide him with love, community, and a wealth of shared stories, memories, and experiences. Tanner, Alexandra. "The Lone Ranger and Tonto Fistfight in Heaven The Approximate Size of My Favorite Tumor." LitCharts. LitCharts LLC, 27 Jul 2017. Web. 24 Apr 2019. Tanner, Alexandra. "The Lone Ranger and Tonto Fistfight in Heaven The Approximate Size of My Favorite Tumor." LitCharts LLC, July 27, 2017. Retrieved April 24, 2019. https://www.litcharts.com/lit/the-lone-ranger-and-tonto-fistfight-in-heaven/the-approximate-size-of-my-favorite-tumor.